Place half the butter in a pan and sautι the onion, add the minced meat and stir until the minced meat whitens and forms into lumps. Then add the tomato juice, parsley, salt, pepper, nutmeg and allspice. Leave the minced meat and sauce to simmer until the liquids have evaporated. Prepare the Jotis Bιchamel Sauce in accordance with the instructions on the packet. Take one cupful of Bιchamel sauce and stir into the minced meat. In the meantime wash and cut the aubergines into fine slices. Melt the remaining butter and using a brush butter the aubergines on both sides. Place them flat in a casserole dish and roast in a hot oven until golden brown on both sides. Place a layer of aubergines in an oven-proof dish, cover with half the minced meat mix and sprinkle over half the Feta cheese. 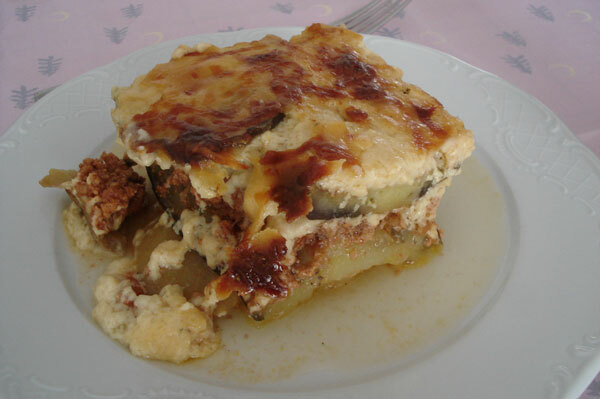 Repeat, once again covering the aubergines with the minced meat mix and Feta cheese. Finally add another layer of aubergines and place the remaining Bιchamel sauce on top and sprinkle with the gruyere cheese. Roast in a fan-assisted oven at 180oC for 45 minutes or until golden brown on top.